Aromatherapy in the Garden! - Amphora Aromatics Ltd – Supplier of pure essential oils and aromatherapy Products. Green Fingers and Gorgeous Smells! There have been some beautiful spring days so far (touch wood! ), and it’s been the perfect opportunity to get out and about in the garden! Gardening can offer us so much; it’s such a great feeling being able to grow and produce your own food, share it with friends and family, plus it’s a great form of exercise and the perfect excuse to spend time outside and enjoy this gorgeous weather! Did you know there are all sorts of ways that you can incorporate essential oils into your gardening routine to help support a healthy garden (and healthy gardener!)? The exciting thing about gardening is that there is always more to learn and all sorts of useful tips and techniques to share! in this blog, we’ll be giving you some ideas on how to incorporate essential oils into your gardener’s world to offer various natural remedies to keep both yourself and your garden in tip top condition! It’s never fun finding that all your hard work, effort and tender loving care you put into your plants and vegetables ends up in the bellies of those greedy slugs! If you want to find a non-toxic and humane way of deterring the pests, there are all sorts of natural alternatives to steer the hungry critters away from your beautiful plants! There are many essential oils that are renowned for deterring insects. It is useful for bearing in mind however, that different aromas will effect various bugs in different ways. Just because lemon-grass and citronella repel mosquitos, it may not be the same for slugs, snails and cockroaches. Here is a brief guide on which aromas deter some of the main culprits for munching on your vegetables! • For Slugs: Hyssop: Cedarwood and Pine. • For Snails: Cedarwood: Pine, Patchouli and Garlic. • For Caterpillars: Peppermint or Spearmint. You can use the same method of adding 6-8 drops of essential oil per gallon of water and pouring into the soil. Alternatively, you can put drops of essential oil onto cotton wool and place them in small pots (perhaps old yoghurt pots) and create a barrier around your beloved vegetables. Strong smelling oils such as peppermint, lemon and eucalyptus will deter not only slugs and snails but help deter dogs and cats from er doing their business on your vegetable beds! (2) Utilising symbiotic relationships between plants. There are many plants which have fascinating symbiotic relationships; you can utilise this through growing certain plants next to each other to strengthen and encourage one another to grow ( for example, Basil grows well alongside a companion of tomatoes or peppers). This companionship can work on various levels; taller plants for example offering shade to herbs and smaller vegetables that don’t require as much sunlight or beans and peas having the ability to fix nitrogen into the soil which in turn benefits other plants, making the soil more nutritious! An alternative to planting companion vegetables together is to mimic their properties and chemical compounds through the use of pure essential oils! This is really easy to do; simply fill up your watering can with warm water and add six (more or less as required) drops of essential oil to roughly two gallons of water (adjust ratios according to size and type of plant). • For Carrots you can use Sage essential oil. • For Broccoli, you can use Basil or Thyme essential oil. • For Cucumbers, you can use Sage essential oil. A flourishing vegetable garden and a perfectly kept lawn can come at a price. All that digging, weeding and lifting heavy sacks of compost – there’s no denying that gardening is an all over body workout! It’s a great form of enjoyable exercise, however it can sometimes be quite strenuous and leave your muscles feeling tired, sore and overworked. Here at Amphora, we have a number of effective, ready to use remedies for muscle ease! Eucalyptus, Black Pepper, Rosemary and Camphor. • For a truly indulgent experience or for extra sore joints, you can finish off with nice warm bath containing one of our pre-blended bath oils such as our Athletic bath oil which contains a warming and soothing blend of Pine, Thyme, Eucalyptus and Rosemary in a base of Sweet Almond Oil to help you revive and recover after all that hard work! (4) Essential oils for tool maintenance! 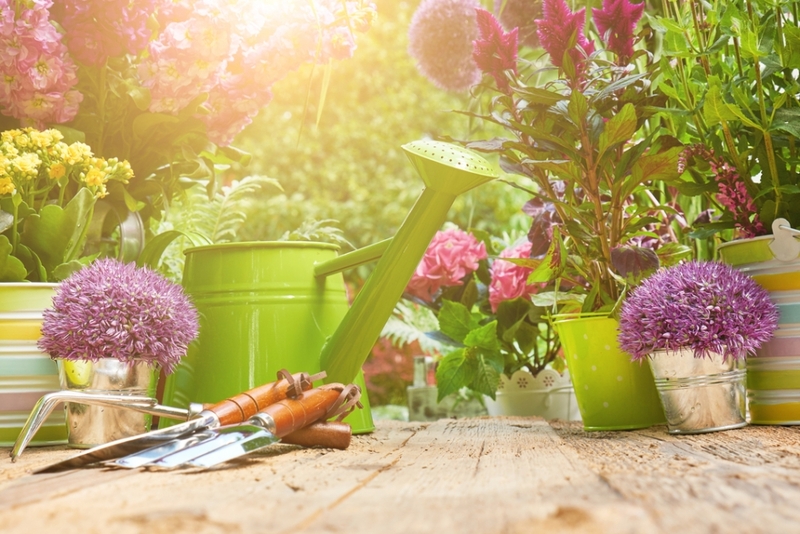 Taking care of your garden tools can mean they have a longer life; avoiding rust and other forms of damage. Regular maintenance will keep your tools in good condition, meaning they will not become difficult to use (putting more of a strain on you!). Using Lemon essential oil can work wonders on any stubborn stains on your tools. Lemon essential oil is an excellent all round, incredibly effective and non-toxic household cleaner. It can be used for everything from cleaning your car windscreen, to cleaning the kitchen floor and maintaining your garden tools in good condition. It is a powerful deodoriser and has the ability to get rid of tough stains and bring shine back to your garden tools! When combined with baking soda, you can create a thick paste to cover rusty spots on your tools. Simply apply, wait a few minutes and then wipe away. Similarly, you can create a soak for your tools after a gardening session. Fill up a bucket with warm water, add a cup of vinegar and 5-10 drops of lemon essential oil. Allow to soak for thirty minutes (be careful not to over soak – vinegar is very effective at eroding away rust but it can also erode your tools if left in for too long! Conventional, chemical laden herbicides may be effective at killing off weeds, but they are also toxic to your surroundings and living things that may come into contact with them (including yourselves and family members!). There are a number of natural alternatives that you can experiment with including utilizing the powers of essential oils to help tame the weeds surrounding your vegetables! One incredibly simple and one hundred per cent natural recipe is to use a combination of coconut and vegetable oil. What makes coconut oil an effective herbicide is that it contains a large amount of fatty acids which when applied to a plant, impair their ability to photosynthesise, thus debilitating them to eliminate waste through transpiration. • 4 Litres of white vinegar (5% acidity) – Vinegar will dry out the weeds, eventually killing them off. Ensure you cover the neighbouring plants you don’t want to kill off with a piece of fabric before pouring your natural herbicide onto the weeds. Spray the mixture directly onto the leaves of the plant (try to avoid the soil!). Check the weeds in a few days’ time and see the results! Thank you for reading and we hope you've been inspired to get out into the garden. Keep up to date with more tips and advice, competitions and more from Amphora by following us on facebook & Twitter :).